A comprehensive guide to making pizza, covering nine different regional styles--including standards like Neapolitan, Roman, and Chicago, as well as renowned pizza sub-specialties like St. Louis and Californian--from chef, 11-time world Pizza Champion Tony Gemignani. Everyone loves pizza From fluffy Sicilian pan pizza to classic Neapolitan margherita with authentic charred edges, and from Chicago deep-dish to cracker-thin, the pizza spectrum is wide and wonderful, with something to suit every mood and occasion. And with so many fabulous types of pie, why commit to just one style? 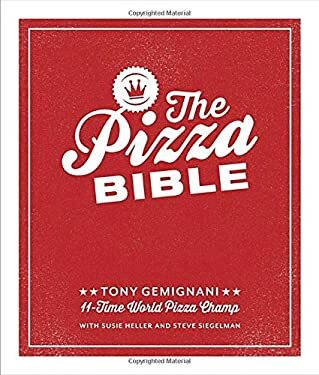 "The Pizza Bible" is a complete master class in making delicious, perfect, pizzeria-style pizza at home, with more than seventy-five recipes covering every style you know and love, as well as those you've yet to fall in love with. Pizzaiolo and eleven-time world pizza champion Tony Gemignani shares all his insider secrets for making amazing pizza inhome kitchens. With "The Pizza Bible," you'll learn the ins and outs of starters, making dough, assembly, toppings, and baking, how to rig your home oven to make pizza like the pros, and all the tips and tricks that elevate home pizza-making into a craft.